Whereas the life off the train is designed to offer cultural interactions, life on board is all about refinement, opulence and elegance. All guest salons are been named after a precious stone or the Navratnas. Each coach incorporates the gemstone after which they are named as its motif. Electronic smoke detection systems & free Wi-Fi internet. Direct International dial telephone facility in each passenger cabin. 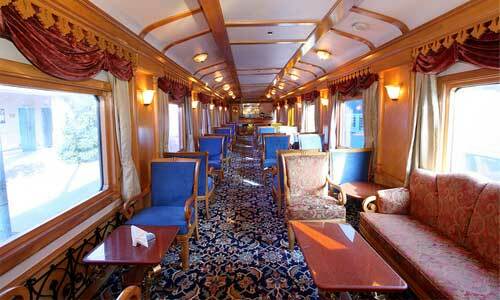 Guests could engage in recreational activities inside the Rajah Club - Lounge Car. Rajah Club has a well stocked library with general books and pictorial guidebooks offering glimpses of Indian Maharajas who used rule their kingdom before India became democracy. 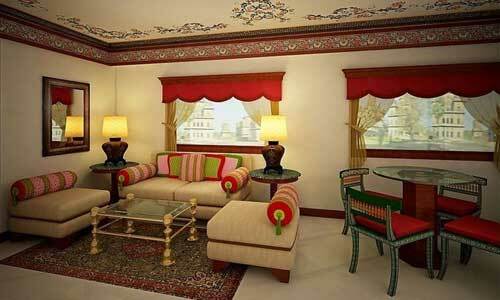 Board games and card games could also be enjoyed in Rajah Club over sip of your favorite wine. At one end stands the bar and at the other stands a souvenir shop named Treasure Chest from where you could buy mementos of this royal train journey. 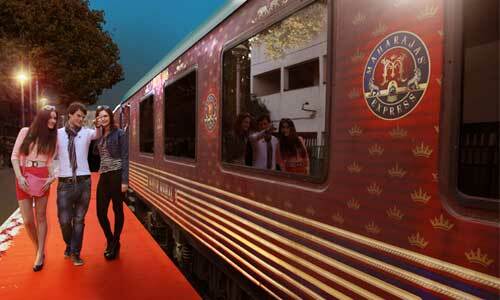 Come live a Maharaja life now on board most luxurious train in the world. Embark on a saga of adventure, elegance and romance on board Maharajas' Express, which definitely is one of the finest travel experiences in the world, a journey like no other.